Your Total Gym XLS will include our new upgraded pulley and cable system, flexible nylon strap handles, an upgraded squat stand, a padded glideboard with head support and the chrome package. You will also receive the wing attachment, leg pull accessory and Pilates kit! All of our TG XLS models include the exercise wall chart, training deck as well as 3 instructional DVDs that will keep you on track and help get you the body you deserve. Take advantage of Free Shipping + 10% off (using code: 11001 at checkout) at Total Gym® today. Act Now! TG 1100 Want to tone your entire body without buying a complete home gym? 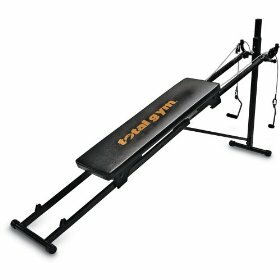 Check out the TG 1100, which helps you strengthen and sculpt every major muscle group in your body. Offering more than 60 different exercises, the TG 1100 works by making you lift a percentage of your body weight against gravity, making the resistance smooth and fluid. As your strength and conditioning improves, you increase the total resistance by boosting the incline, thus increasing the body weight lifted in the exercise. The Total Gym 1100 not only works your upper body, but also your lower body, abdominals, and even your cardiovascular system. The compact, efficient trainer can replace an entire gym of equipment, yet folds away for easy storage in a closet. Also outfitted with wing and leg attachments, the TG 1100 measures 99.5 by 43.75 by 16 inches (W x H x D), weighs 54 pounds, and carries a one-year warranty. 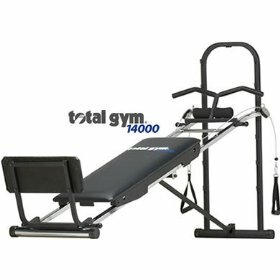 TG 14000 With over 200 strength, stretching and Pilates exercises, and six resistance levels, Total Gym 14000 provides full-body functional training that utilizes the core muscles of the stomach and back in every workout. You and your family can achieve your individual fitness goals, whether you want to lose inches, gain muscle, improve stability, or maintain peak fitness and performance levels. The NEW Total Gym 14000 accessory mounting system features solid, quiet, retractable pins with easy grip knobs. TG 14000 offers upgrade options that substitute the standard Squat Stand for a wide-based Telescoping Squat Stand with three adjustable height settings. The standard Wing can upgrade to the NEW 3Grip Pull-up Bar, Press Bar and Folding Foot Holder that tucks out of the way when not in use. Total Gym 14000 folds away easily for storage. "I brought total gym for my wife when first total gym came out, almost ten years ago. I am a person that thinks about quality and safety of my wife.I am here to tell you that everything they claim is true. My wife love Total Gym. It is fun easy to use, and a good workout. I have noticed more energy in my wife." TG 1700 The Total Gym 1700 Club also offers several handy attachments that add a new dimension to your workout: a Pilates bar that helps you improve your range of motion and balance; a weight bar that lets you add up to 75 pounds of additional free weights to intensify your workouts (weights sold separately); dip bars and press-up bars; and an exercise mat to help protect your floor. All it takes to get in great shape is 15 to 20 minutes per day, three to four times a week.